This is an exceptional Bascal listing! 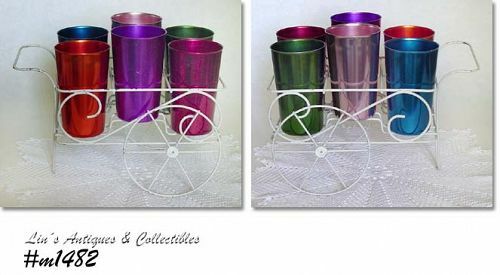 There are 6 bright color tumblers in wonderful conditon with very, very, minor "use" evidence. They measure 4 3/8" tall, colors are red, dark green, pink, dark blue, rust, and bright purple/fuchsia. They are stored in their own metal storage unit that is shaped like a flower cart! A lovely display! !